AC TIG Features Independent amplitude/amperage control allows EP and EN amperages to be set independently to precisely control heat input to the work and electrode. Extended AC balance controls the amount of oxide cleaning (amperage time in EN) which is essential for high quality welds on aluminum. AC frequency (20–400 hz) controls the width of the arc cone and the force of the arc. DC TIG Features Exceptionally smooth and precise arc for welding exotic materials. High-speed DC TIG pulse controls - Pulse frequency capable of pulsing 5000 pulses per second. Pulsing adds arc stability, reduces heat input and warpage and can increase travel speeds. Other parameters include peak amperage, peak time and background amperage. Advance Squarewave provides a fast freezing puddle, deep penetration, and fast travel speeds. Soft Squarewave is used for a soft buttery arc with maximum puddle control and good wetting action. Sine wave is for customers that like a traditional arc. It is quiet with good wetting. Triangular wave reduces the heat input and is good on thin aluminum. It provides fast travel speeds. 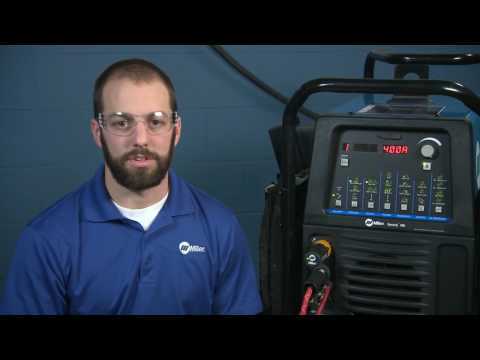 Learn more about using proper polarity, adjusting balance control and setting AC amperage independently when welding aluminum. Choose the right filler metal and follow key best practices to overcome the welding challenges presented by some materials. The Miller® Dynasty® machines used by Fort Defiance Industries provide capabilities for a dynamic manufacturing environment. Learn when to use a low frequency setting versus when to use a high frequency setting.